Why are my personal finances important? When you think of personal finances, what comes to mind? The reality today is that most people, including lots of Christians, don’t understand the true meaning of honoring God with their finances. And that’s a tragedy. Why? Because being a good steward with our personal finances is our ultimate calling as Christ followers. Each morning, God gives you a day full of opportunities to praise him - chances to notice the small, but extraordinary gifts from your heavenly Father. Just imagine how abundant your life could be if you got serious about stewarding the little moments every day, not just with money, but with your marriage, parenting, personal development, and career! Stay up-to-date on the latest personal finance resources, relevant articles and other current events by subscribing to LCBC’s Money Matters email resource! 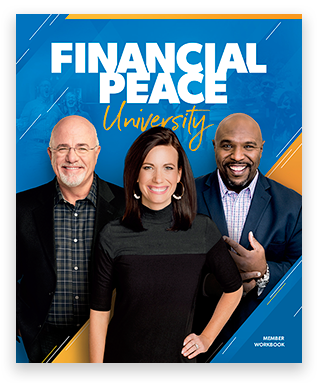 Financial Peace University is a life-changing 9-week program that takes the knowledge of the Bible and turns it into real action in our lives through a simple step-by-step process. The program is an intersection of faith and finances that includes practical lessons to eliminate debt, build wealth, give like never before, and much more! Your Life. Your Money. In Sync! Want less stress? Budget more and worry less! Managing money wisely will help you honor God with your finances! After just 3 months of budgeting 84% of people say they feel more in control of their money. Whether you want to create your budget online, in an app or on paper, we can help! How to Budget Using Simple, Zero-based Budgeting. Write down your total take-home (after tax) pay for your household. Don’t forget to include everything - full-time jobs, second jobs, freelance pay, social security, royalties and any other ongoing sources of income. List all of your expenses and savings goals. Subtract expenses from income to equal zero – this is called zero-based budgeting. Track your expenses and savings goals monthly to stay on top of your expenses. The Journey of A Thousand Miles Begins with A Single Step. It's smart to start small and build. When you tackle the small tasks first, you finish them quickly and see your progress. That gets you fired up about going after larger projects. Below you will find link to the best biblically based personal finance podcast out there today! And best of all, they are free! Available to download online or your favorite app store. You could easily search the web for a list of agents or advisors in your city to help you with your tax, insurance, or real estate needs. In fact, you probably already have. But you have higher standards. You're looking for the best. And so are we. The ELP program was designed to help people like you find top-rated local professionals who have the heart of a teacher. We go through a rigorous screening and ongoing evaluation process to ensure that each ELP provides top notch service and expert advice, and that they are someone you can relate to and trust. The Legacy Journey class is a biblical based course that teaches you how to truly live and leave a legacy for generations to come. It picks up where Financial Peace University leaves off through a six-lesson course that takes a deeper look at Baby Steps 4-7 and teaches you how to plan for your future. The Legacy Journey is now included with Financial Peace University membership and you have access to all The Legacy Journey content for entire time that your FPU online content is active. Stuck on your financial journey and unsure of your next step? We’d love to help you. We have trained coaches at each LCBC location that are ready to help you take your next step towards financial peace. As an FPU alumni you have access to the online content for 12 months from the date you activated it. Here you can re-watch any lesson and explore the additional tools and teachings. After reviewing the resources on this page, if you feel financial coaching is your best next step, please fill out the confidential application at the link below.